Acne is known as acne vulagris in medical terms. It occurs when a teenager goes through hormonal changes. An oily substance known as sebum gets secreted and clogs the pores. Acne is medically known as ‘acne vulgaris’ and is very common among teenagers. It occurs when an oily substance known as sebum clogs the pores. Here are some of the causes for it and ways in which you can control them. Acne break outs happen mostly due to the way your skin reacts to the hormonal changes that you will experience during your hormonal changes. There are sebaceous glands in your skin that releases sebum, which is an oily substance and helps protect it. When a person hits puberty the levels of testosterone hormone gets raised and causes too much sebum to be produced, and this happens for both boys and girls. This sebum blocks hair follicles and as dead skin cells mix with the blockage it leads to the formation of spots. There are four different types of spots when it comes to acne, you have the blackheads that are small, blocked pores, you have the whiteheads which are small, hard bumps with a white centre, you then have the pustules that are spots with a lot of pus in them, and finally the nodules that are hard, painful lumps under your skin. What is known as inflammatory acne is when the skin is red and swollen and needs to be treated at an early stage to prevent it from scarring. The truth is that there is no specific reason for acne outbursts, except for the fact that it is your skin’s way to react to hormonal changes. These as you can understand are pretty out of our control. Androgen hormones rev up the oil production and your skin suddenly begins to get oilier and more oil would mean more pore blockages. Acne can also get worse if you stress and women can be affected by it during their menstrual cycle, and can also occur during pregnancy. You must not pick or squeeze on them as this will cause inflammation and scarring, the spots will eventually go away. You could certainly try and control acne safely and surely in the following ways. Drinking water is a very popular way in which you can flush toxins and hydrate your skin from the inside out. Researchers at the University of Missouri-Columbia found that by drinking about 2 cups of water can significantly boost your blood flow throughout the body and skin. There is a need for your body to get rid of the waste materials that are produced during metabolism. This can happen when you drink enough water. Touching your face or rubbing your cheek and chin with your hands can have a negative impact. 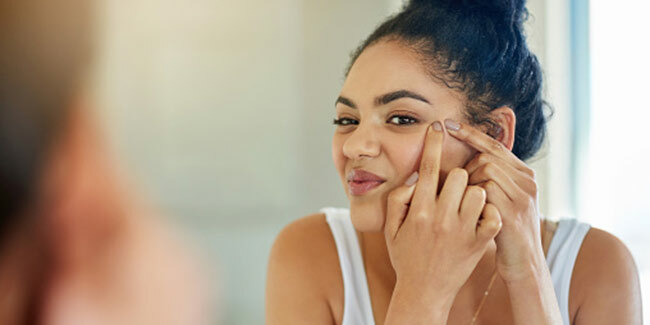 These can cause bacteria to spread and there is a possibility that the bacteria will spread on your skin and cause for inflammatory acne to grow. Also you should never pick or pop pimples with your fingers, as you will catch infection. Acne products contain ingredients that will dry the skin and therefore you must always use a moisturizer that will reduce dryness and skin peeling. When you decide to buy one, look for “noncomedogenic” written on the label as this would prevent acne. You will find moisturizers made for separate skin types, such as for oily, dry, or combination skin. When you have an acne breakout, you need to avoid wearing foundation, powder or blush. If in case it is very necessary for you to apply makeup then you must wash it off after wards, at the end of the day. Choose oil free cosmetics that do not have added dyes and chemicals again choose makeup that is labeled as "noncomedogenic," which would not cause acne. It is not really on your hands to get acne or not, but you can definitely do much to try and prevent it. 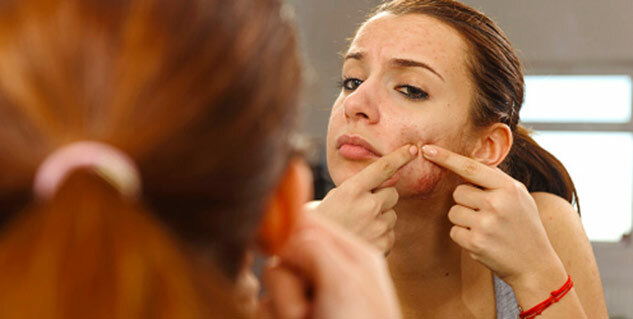 Read more articles on Acne.